Despite back pain still torturing him after recent spinal surgery, Evgeni Plushenko, gave an impressive short program performance at the opening of the Olympic season at the Volvo Open Cup in Latvia. Evgeni Plushenko, an Olympic Champion in figure skating who is still recovering from back surgery, placed first in the short program at Volvo Open Cup tournament in Riga on November 7 with a score of 82.34 points. Plushenko, 31, has not appeared in official competitions since pulling out from European Championship in Zagreb in January owing to injury. He underwent a spine operation thereafter in Israel, followed by a long recovery period in which he could not train. The Russian Olympian is training actively now and is successful in executing quadruple jumps and 4–3 cascade. 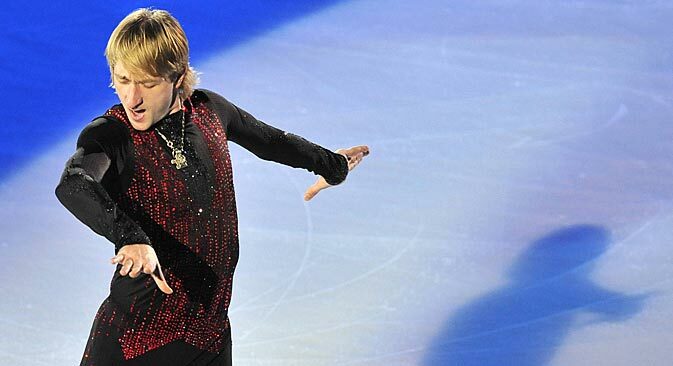 A decision to perform at the Riga tournament, which is not considered a very prestigious one and in which Plushenko is the sole star, was triggered by the necessity to gather a minimum of rating points. Failing to do so would make it impossible for him to participate in European and World Championships, as well as the Sochi Olympic Games, according to International Skating Union rules. "I have not performed for 10 months. I was certainly greatly worried but controlled myself since the first start is always hard, after such most complicated operation especially" Plushenko told the ITAR TASS correspondent after his first skate this season. "I did not think everything I wanted would turn out. The fourth jump missed, surely, but the program was worthy. Pirouettes were poor, I would not conceal that, since I controlled all moves and emotions very intensely. Program are not skated yet, and they cannot, since it is the first tournament. Naturally, I skate better at trainings. The first start has been made now, the first stage is over, so we are waiting for tomorrow. Whatever it would be, it will be necessary to pass such competitions, recall the atmosphere, and see whether or not my back and health allow performing moves completely, since my back does not let me do things I did a year or two ago at 100 percent." "It's hard of course, but I have a pleasure skating today", the athlete continued. "I even smiled being called for! I felt somewhere in the depth of my heart that I have returned to sports at last, returned to competitions, although minor ones. But you need to start up lower to reach the top purpose - the fourth Olympics." According to Plushenko, backaches still torture him, and he cannot do without anesthetics. "Yes, I had four anesthetics today, two at the morning training and two more for competitions. It helps a little, and I have no such aches as previously" he said.